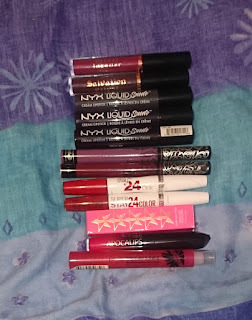 All in all I have 76 lipsticks! I told my dad that I have that many and he was disgusted! I personally don't think that it's that many, but I know a lot of other bloggers with hundreds! I definitely don't use 76 though so it's time to get rid! I decided to do this in a few posts because I thought I would also talk about how I get on with these products, and I would rather go through shorter posts than one long one! Stick around for the end for the swatches! 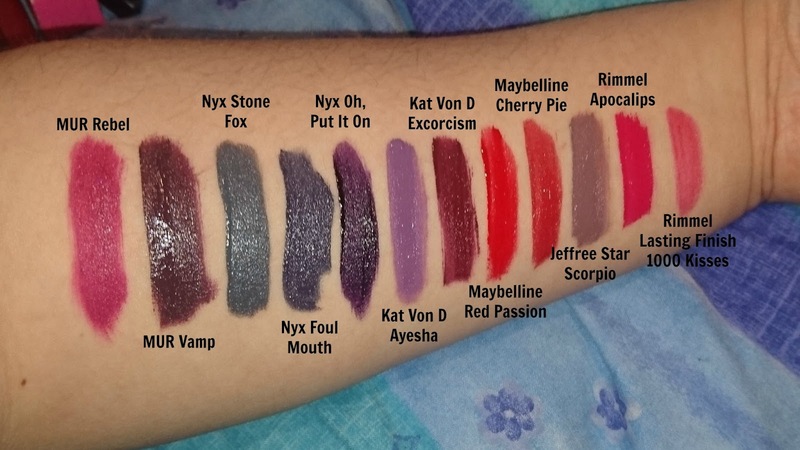 I was hoping to take pictures all in one session for this post... but I made the idiot decision of swatching my liquid lipsticks first... which didn't turn out well! 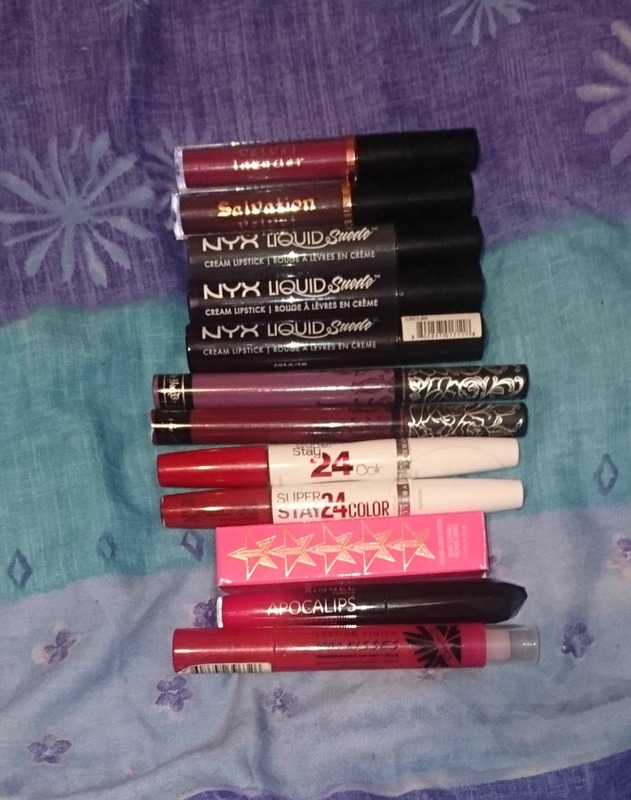 Liquid lipsticks have been my favourite for a while now, even though I don't have that many. The formulas work for me and I hate having to reapply product, so these tend to set me up for the whole day usually. 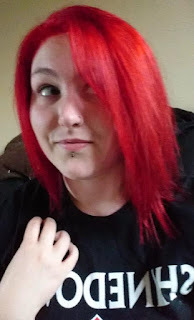 The Makeup Revolution Lip Salvations were the first that I bought and I really liked them. They stayed well throughout the day and the colour was intense. They didn't dry my lips out either which is obviously a good thing. 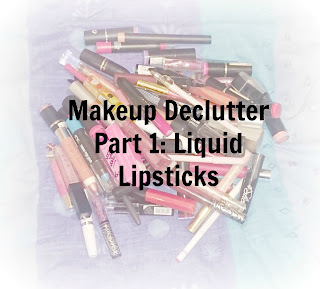 After trying some other liquid lipsticks out, however, I did find that they flaked a little easier than others, but not enough for me to stop using them. I tended not to buy more expensive makeup products a few years ago because, well, I just couldn't afford it! But when I found that Kat Von D products were coming to the UK I had to give them a try! I fell in love with these lipsticks and I really hope more shades become available as they are amazing! The Maybelline Super Stay 24hrs was the first liquid lipstick I ever got, as a friend bought it for me. I tell you something, these. Do. Not. Budge! Like, I can go out at 7PM one night and it will still be in place after I have fallen asleep drunk out my face and woken up to wash my face the next morning. These are AMAZING and for the price they do incredibly well! Jeffree Star's Liquid Lipstick is the newest addition to my collection and I'm already planning which shades I want next! These are so so comfortable on the lips and last really well throughout the day. Sometimes they require touching up, but to be honest, for how comfortable they are to wear, this is not a problem. I bought the Rimmel Apocalips lipstick when I found it in Poundland. If I'm honest, I really don't get on with this product, it's too pink (my problem), too glossy and you can't seem to wear it without it smearing everywhere. It never sets enough for it to be comfortable and is really tacky on the lips. It also smells like watermelon which I absolutely despise. Although I've tried to use it, I think this one is going to have to leave my collection! The last product I have in this section isn't really a liquid lipstick but it's the only felt lipstick that I have so I thought I'd throw it with these. This was also a bargain find in Poundland but this one worked a little better. It's another Rimmel product. It's the Rimmel Lasting Finish 1000 Kisses Felt Tint. The felt was really easy to use and applied a decent amount of colour to my lips. Sometimes if my lips are dry the colour comes out more pigmented but it tends to be pretty even. It seemed to dry out a little quickly in the tub though so I'm not sure if I would pay full price for it myself. Out of my liquid lipstick collection I have only gotten rid of 1 product, but I'm not too disappointed because I use these most of the time! I'll keep on putting these posts up until I've finished by collection. 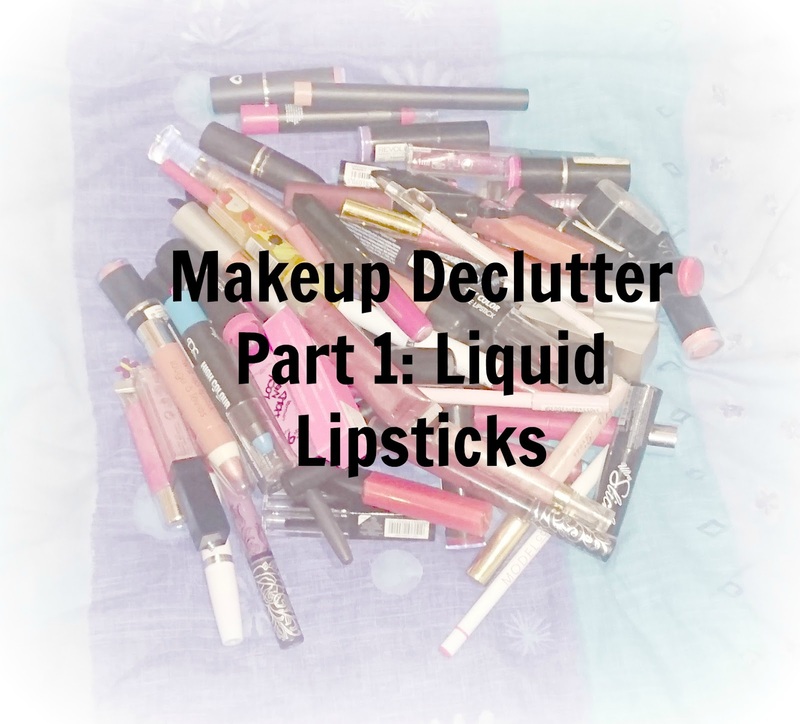 Have you done any makeup decluttering?